Select Medium Texture is designed to add that extra depth and texture to your life. It recreates natural textures - coarse sand, the grainy surface of stone, or the spiny feel of dried coral - in a choice of neutral or muted earthy shades. Select Medium Texture is an aesthetic, medium-textured exterior finish that is designed to thrive in the region’s challenging weather conditions. Containing titanium dioxide, mica, quartz, and even marble chips, it is long-lasting and exceptionally tough. 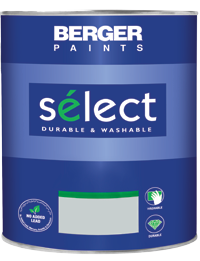 Surface preparation Clean the surface and prep it with one coat of Berger Acrylic AR Primer, or Weathercoat Primer. Application procedure Apply two coats of Select Medium Texture. The right technique is essential for nailing this finish - our master painter show you how. A textured exterior finish, with marble chips, that stays beautiful no matter the weather. It bridges cracks, resists microbe growth and UV. A durable exterior finish of a distinctive texture, with crack bridging, anti-microbial and weather resistant properties. A signature textured exterior finish, with marble chips, formulated to offer protection against UV rays, microbe growths and cracks. A hard-wearing, UV-resistant and crack-bridging exterior finish that is fortified with marble chips, and creates the ambience of a rustic Italian villa.